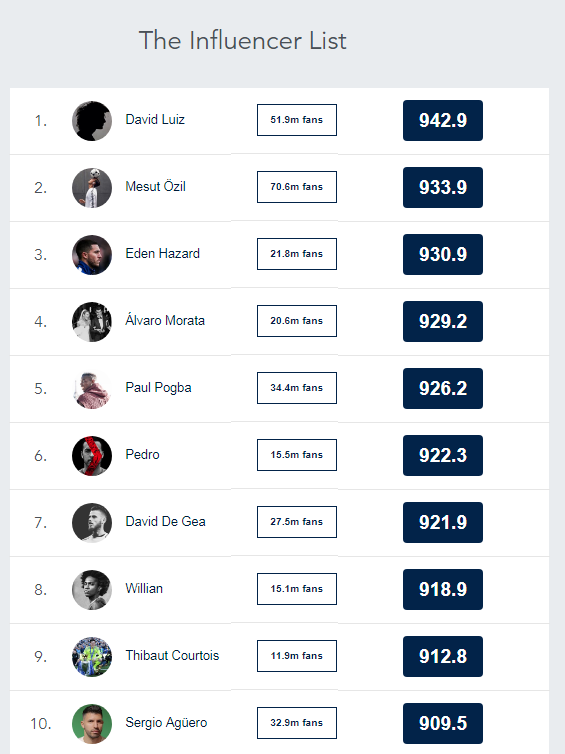 David Luiz, Mesut Ozil and Eden Hazard are among the top UK Premiership players in the first of a new football social media influencer index. The data, from Filter Digital, evaluates marketing value through a combination of social following, engagement metrics and team performance. The platform – Sportstar Influencer (https://sportstarinfluencer.com) – uses social, engagement, media, and sentiment datapoints to rate and rank sports players against each other, comparing them at a local, national and international level. The launch of the platform includes the first public dataset - the Barclays Premier League. Providing an individual score for every single player in the league, and ranking both players and teams in order of their index score and their social following, the Influencer List shows where each player ranks against their peers and on each social network. The sports industry is becoming increasingly important to brands and sponsors, who are seeking to use influencer marketing to place their products in front of their target audiences. By understanding how players rank against each other in their own sports, as well as across multiple sports, brands and sponsors can take better decisions over where they spend their budgets. Before Sportstar Influencer, brands needed to run their own analysis. The SSI platform provides an opportunity for those with less internal resources to find sports players that match their requirements, or work with the team on more complex needs – such as understanding target demographics, real-time sentiment and media buzz. The Premier League is the first dataset available publicly, and for free. In June, the dataset for the World Cup 2018 in Russia will be launched, shortly followed by a move into tennis in July to coincide with Wimbledon.